Friday July 14th in the 6-9pm window we are tasting a array of French whites: a Sylvaner based, dry Alsacian blend, a delicious Alsacian Pinot Blanc, a weighty yet clean Marsanne blend, a spectacular Chablis, an easy going French country blend and an unbelievable Loire Sauvignon Blanc. This tasting is $15 per person. Must be 21 to attend. Cheers! Friday July 21st in the 6-9pm window we are tasting wines perfect for these hot, summer days: a dry, delicious Washington State rosé, a killer Chilean Pinot Noir rosé, a juicy Argentinian Malbec, a light yet savory Southern Italian red, a dry, chillable, blueberry-laden Spanish Trepat and a dry, chillable Chilean Carignan. This tasting is $15 per person. Must be 21 to attend. Cheers! Friday July 28th in the 6-9pm window we are doing a blind tasting of whites. Blind means the wines will be brown-bagged so you don’t know what you’re tasting until after. This tasting will run a little different. I ask that you be here at 6:15pm, 7:15pm or 8:15pm as we will taste and reveal the wines in groups. This tasting is $17 per person. Must be 21 to attend. 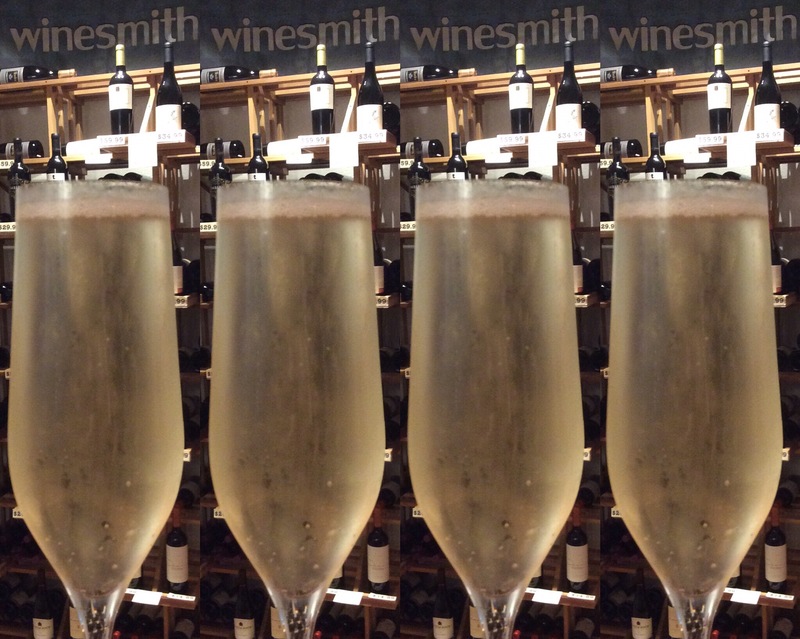 Winesmith sells wine retail and by-the-glass Monday-Saturday 12ish-9pm or later. Cheers! First Friday June 2nd in the 6-9pm window we are tasting Southern Hemisphere wines: a clean, refreshing Sauvignon Blanc from Uruguay, a bold yet balanced Argentinian Malbec, a beautiful bubbly from Tasmania, a DRY, crisp Australian Riesling, a hearty South African red blend and a delicious South African Chardonnay – one of the best I’ve tasted in a while. This tasting is $17 per person. Must be 21 to attend. Friday June 9th in the 6-9pm window we are tasting whites from Italy & France: a soft, savory Soave, a complex, crisp Pinot Grigio, an energetic, salty Vernaccia, a seafood-wanting Picpoul de Pinet, a weighty yet clean Marsanne and a spectacular white Burgundy (Chardonnay). This tasting is $16 per person. Must be 21 to attend. Cheers! Friday June 16th in the 6-9pm window we are tasting chillable reds: a Beaujolais-esque Spanish Trepat, a juicy Montepulciano d’Abruzzo, a savory, meaty Italian Gaglioppo, a Chilean Pais/Carignan blend, a 100% Chilean Carignan and a South African natural sweet red. This tasting is only $15 per person. Must be 21 to attend. Cheers! Friday June 23rd in the 6-9pm window we are tasting Bubbly: a soft, dry Vouvray Brut (Chenin Blanc), a Cabernet based French Brut rosé, a crowd-pleasing Cremant de Limoux, a funky, yeasty, French Molette/Altesse blend, a bone dry unfiltered Prosecco and an Italian Moscato d’Asti that tastes like peaches in a glass. This tasting is $25 per person and includes a selection of fine cheeses. Tickets available here: http://buytickets.at/winesmith/100580. Must be 21 to attend. Cheers! Friday June 30th in the 6-9pm window we are tasting dry rosé: an effervescent Portuguese Vinho Verde, a mineral driven Grenache Rioja, a lively Provence Mourvèdre based blend, a full-bodied Argentinian Malbec/Cab blend, a Cabernet based French sparkling and a delicious Argentinian Pinot Noir rosé. This tasting is $15 per person. Must be 21 to attend. Winesmith sells wine retail and by-the-glass Monday-Saturday 12ish-9pm. Cheers! First Friday April 7th in the 6-9pm window we are tasting springtime whites: a dry, crisp Loire Muscadet, a tasty Sauvignon Blanc from Uruguay, a crowd-pleaser French Sauv Blanc, a mineral driven Spanish Verdejo, a rare dry white from Argentina and a fruity, clean Portuguese Alvarinho. This tasting is $14/person. Must be 21 to attend. Friday April 14th in the 6-9pm window we are tasting my hottest new wines: a dry Pinot Noir Rosé from Argentina, a delicious Old Vine Spanish Grenache, an unfiltered, dry, Frizzante Prosecco that drinks like a sour beer, the Spumante Prosecco from the same winery, a chillable, rustic, dry Chilean red and a semi-sparkling Orange wine from Greece (made from grapes, not oranges). This tasting is $14 per person. Must be 21 to attend. Cheers! April 21st is my birthday so we’ll be tasting my favorite Bubbly 🥂 in the 6-9pm window: a rich Grand Cru Blanc De Noir Champagne, a gorgeous Premier Cru Champagne, a yeasty, funky French gem that drinks like Champagne for a third of the price, a dry, Loire Cab Franc based rosé, a bone dry, crisp Cava and an unfiltered, bone-dry Prosecco that drinks like a sour beer. This tasting is $20 per person and includes a selection of fine cheeses 🧀. Must be 21 to attend. Cheers! Friday April 28th in the 6-9pm window we are tasting dry rosé: a Mourvèdre based Bandol beauty, a delicious Pinot Noir rosé from Argentina, a classic from Provence, a full bodied, Argentinian Cab-Malbec rosé, a Portuguese Vinho Verde rosé and a sparkling Pinot Noir rosé. This tasting is $14 per person. Must be 21 to attend. Cheers! Little Light Of Mine provides complimentary photography services to families who have children fighting a life-threatening illness. They rely solely on donor support to fulfill their mission. Their photography services are offered to families receiving treatment at Johns Hopkins All Children’s Hospital, several local pediatriac hospice groups as well as The Children’s Dream Fund. Their 2017 goal is to make sure that every family in the Tampa Bay area faced with losing their child will be able to receive professional portraits from their team. Please join us Wednesday February 15th, 7-9pm for an amazing tasting benefiting Little Light Of Mine. $30 for advanced tickets, $35 the day of and includes 15 wines plus charcuterie. 50% of the door and 10% of the wine sales during the tasting will benefit Ltitle Light of Mine. Must be 21 to attend. Winesmith serves by-the-glass, bottle and retail Monday – Saturday, 12ish-9pm. Cheers!